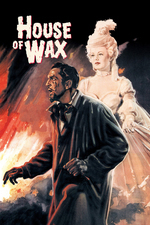 An associate burns down a wax museum with the owner inside, but he survives only to become vengeful and murderous. Vincent Price stars. An October bonus pick from the MeFi Horror Club. Vincent Price, man. VINCENT PRICE. Oh, man. I saw this when I was about seven years old and it's haunted me ever since. Watching this again, you can truly see how this made Price's career. He's marvelously urbane and sophisticated while still uber-creepy and evil. Bonus: Tim Burton's short "Vincent". Even in 2-D, it's a fun movie.